Most of us know how “good” trees are for the urban environment, and for the planet overall. Whether you’re a human, an insect, a fungus, a bat, a bird, a four-legged omnivore, or an amphibian, we all love trees. Trees are symbols of health, vitality, and goodness. For the greater landscape and environment, trees and woodlands connect the lithosphere and the atmosphere through their role in the water cycle, whether by absorbing liquid water and facilitating infiltration into the soil and aquifers, or evaporating and transpiring water vapour, along with oxygen and other molecules, into the atmosphere. When it comes to street trees, recent lessons in Sheffield show that we must stay on top of current knowledge, and then put it to good use. Trees, it would seem, can do no wrong. As in the case of any complex issue, however, there is no such thing as a silver bullet, and the same applies here. 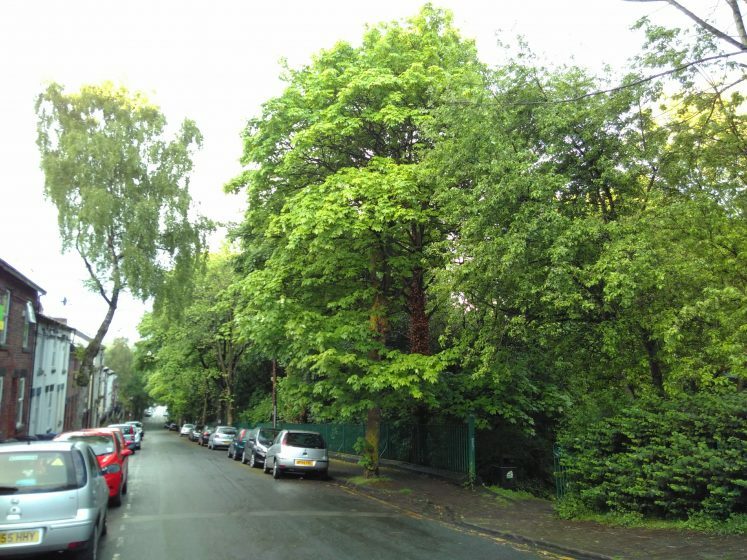 With this essay, I’d like to explore some good, some bad, and some ugly stories pertaining to urban trees and forests in Sheffield, England, where I’ve been living for seven years. Beyond the pleasing, round number of an 800-year anniversary, the timing of this initiative is resonant. Given that humanity is now an urban species, we are much less aware of how our woodlands are managed than when we depended on them for our livelihoods. Around Sheffield, there are certainly many political symptoms of this evident disconnect (see The Ugly). 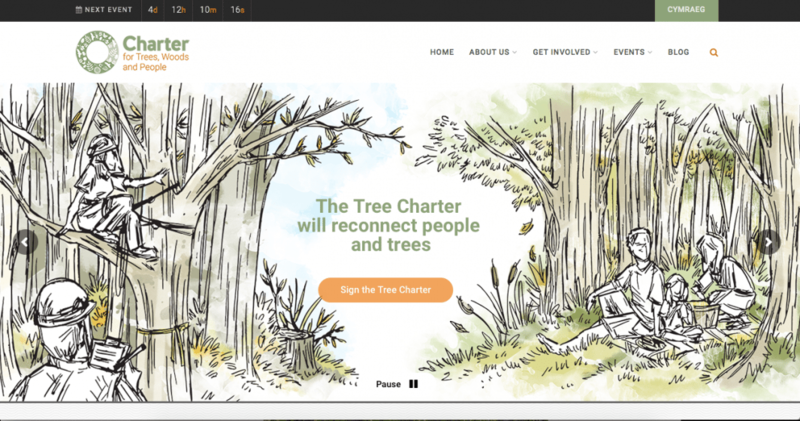 Accordingly, the Tree Charter aims to facilitate interest and engagement; promote the development of ecological sensibilities; and encourage the development and expression of personal connections with trees and woodlands. Only when we care for something will we protect it. 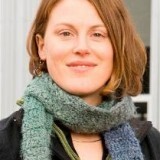 From my own experience as a “Charter Champion” for Sheffield, together with like-minded friends, we’ve created a group called Sheffield Woodland Connections. After months of familiarising ourselves with Sheffield’s most accessible (and South Yorkshire’s largest) ancient woodland, Ecclesall Woods, we are leading interpretive walks and inviting participants to become more personally involved in the woodland, perhaps by “adopting” a living feature, such as a veteran tree, and making regular experiential records of it for example, photographs, drawings, writing, measuring). These data can be shared on an interactive map that we have developed, and which will be online soon. After our launch event in April 2017, it has become apparent that we are filling a gap and addressing a need. While I hoped that people would enjoy our walks, the feedback we received was tremendous. 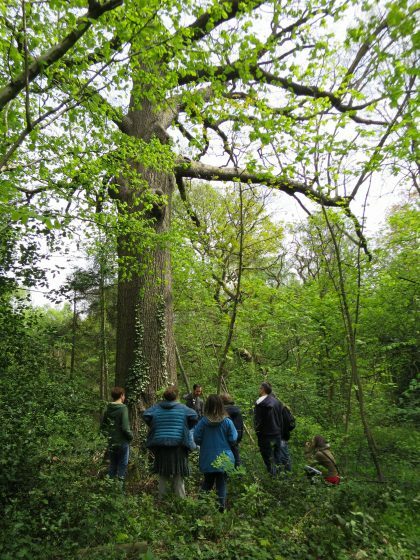 (One of my highlights: “I’ve always wanted to know how to identify a Hornbeam: thank you!”) The tangible “good” in this case is creating connections, both amongst people and between people and a cultural woodland. I’m confident that providing people with the inspiration and tools to learn more about and engage with the natural world is profoundly good. 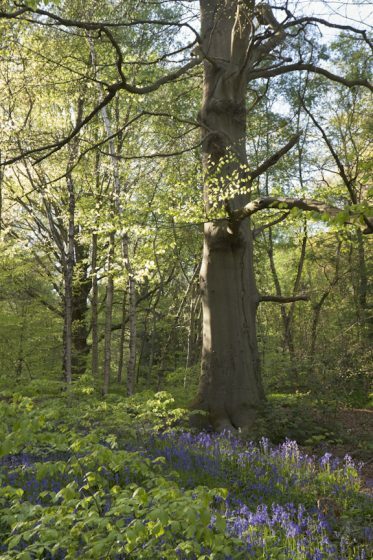 The Charter for Trees, Woods and People will be launched by the Woodland Trust. You can sign the charter, too! I recently learned some of the latest research on urban trees and urban forests at the GreenInUrbs conference in Orvieto, Italy, and was distressed to learn that trees and urban vegetation can have negative effects on air quality. Just as some species can tolerate air pollution or cramped growing conditions better than others, some species can break down urban pollutants whereas others will succumb to poisoning, and some will emit vapour while others will close their pores. Issues such as allergens, ozone formation, and how plants deal with particulate matter play an important role in the quality of the urban atmosphere. Like most living things, plants emit volatile organic compounds, or VOCs, in the form of evaporated vapour or as sublimated solid resin. The main compound of plant-based VOCs is isoprene and its derivative, terpene. Under natural conditions, biological (or biogenic) VOCs are used for communication between plants, but the volatility of these compounds is also a response to temperature. It has been found that urban trees emit more VOCs during heat waves, and that this is a synergistic interaction with the urban heat island. In other words, urban trees are key agents in the formation of ozone and smog during hot weather. Based on a study of the 2006 Berlin heat wave (spanning 20 days in July in 2006), for example, Churkina et al. reported that 60 percent of the VOCs in the ozone had originated from the urban vegetation. They determined the varying contribution of VOCs from vegetation to ozone levels in Berlin as follows: ~9 – 11 percent on average days in June and August, ~17 – 20 percent on average days in July, and ~60 percent during the heat wave. 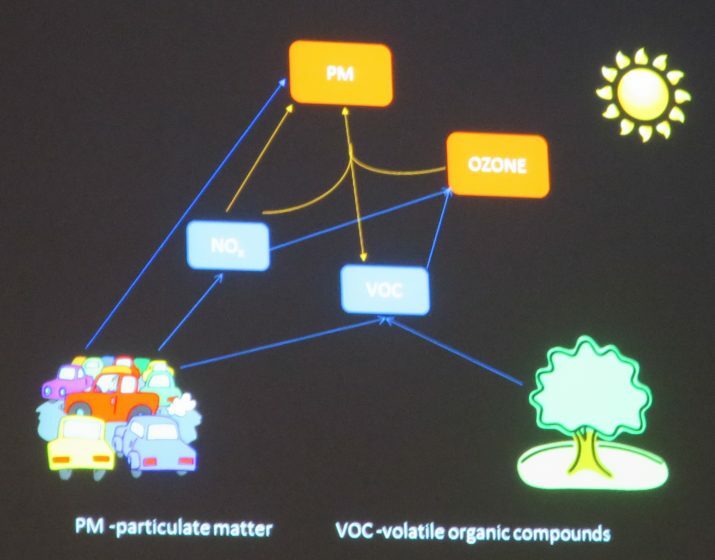 Biogenic VOCs combine with air pollution to form smog. Photo: Galena Churkina. Researchers have reported that there are “crucial knowledge gaps associated with exacerbated emissions of pollen and volatile organic compounds, which may increasingly contribute to tropospheric ozone and particle formation under future climatic conditions” (Grote et al., 2016). Apparently the potential for urban vegetation to produce ozone in combination with anthropogenic emissions “has long been recognized, [but] the municipalities actively enlarging their green spaces still generally either overlook or ignore this fact” (Churkina et al., 2015). This latter comment leads neatly to an Ugly story pertaining to urban trees in the U.K.
With more than 250 parks, woodlands, and gardens, Sheffield is Britain’s most treed and wooded city (10.4 percent woodland by area). 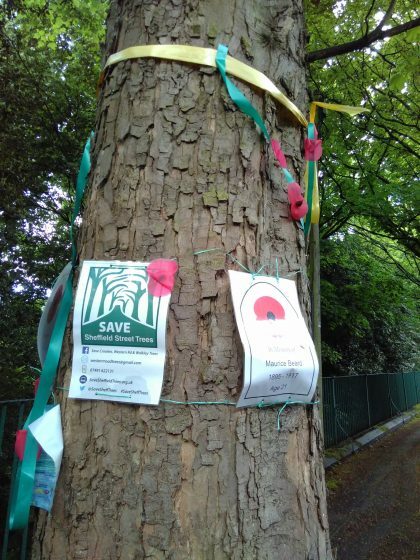 In spite of its leafy and green reputation, Sheffield has been receiving bad press recently with regards to how its street trees are being managed and, more troublingly, to how its citizens’ rights to protest are being subjugated. In 2007, City Council adopted a methodology document, “Streets Ahead”, which categorises trees into one of 6 “D” categories: dead, dying, dangerous, diseased, damaging, and discriminatory. (The last D implies compromises to the sidewalk or pavement by roots, or to branches which could impede a person passing by the tree.) Streets Ahead is part of a £2.2 billion, 25-year PFI contract with Amey plc to maintain the city’s roads, pavements, streetlights, and trees. Herein lies the thorn. Amey is a private, multi-national infrastructure support service provider, for whom chopping down a tree is objectively more economical than maintenance over the long term. Of the thousands of trees already cut down, subsequent examinations have concluded that many of these trees were healthy, structurally sound, and, in some cases, very old. Unfortunately, the species lists for replacement trees are difficult to access and it’s unclear whether the trees being planted are “future-proof”. Currently, more than 20 old memorial trees, planted to honour a local group of young soldiers killed in World War I, are slated to be chopped down. For some citizens, this is akin to desecrating a war memorial. You just don’t do it. The tree felling, and the situation in general, has led numerous citizens to defend individual trees, particularly those outside their homes. A peculiar form of law enforcement that has come to accompany the felling has inflamed the situation further, and brought Sheffield into the national spotlight. Numerous residents have been woken in the early hours of the morning by police officers knocking on their doors, requesting that they move their cars from the street. Fourteen people have been arrested since November 2016 for standing next to trees and protesting their felling, under a law originally designed to prevent strike breakers from working. All charges have been dropped, but tensions remain high and a Sheffield Tree Action Group, a decentralised, citizen-run tree vigilante, is on guard and ready for action. It is worth mentioning that this issue aggravates concerns around fracking, as licences have apparently been granted for shale gas exploration to nearly every town and village in the region. What these recent and current experiences evoke for me is how differently urban trees can be viewed. As an engaged citizen and plant ecologist, it feels profoundly good to introduce interested folk to the incredible details, stories, or functions of woodland flora. One of my favourite things is enabling connections between people and the natural world, by introducing the subtle lens through which to see certain things in high resolution. Have you ever had that experience of identifying a plant, for example, and suddenly realising that it is everywhere, yet you hadn’t noticed it before? I feel such experiences broaden our ability to see other forms of life more personally. 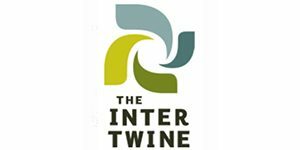 When I sense my interconnectivity with other things (for example, that I comprise the same elements as plants, animals, air, and water), the small insight gained from such visceral understanding has a very positive effect on my state of mind and well-being. Just sitting in the natural world can be an especially calming experience for this reason. The other side of the coin, of course, is that some people view urban trees not as resources or habitat, but as nuisances and problems. And not to say that this is incorrect, since all views are limited in scope, whether good or bad. In Sheffield, the practitioners who are responsible for urban trees are trained, and accustomed, to working with hard infrastructure and big machinery. Given those conditions, and given the situation of the PFI contract, it is not surprising that so many trees are being chopped down. It is interesting to think that while many people agree that the “Sheffield Tree Massacre” is BAD, the reasons will be manifold. With regards to the trees being planted today, and the possibility that uninformed species choices could potentially be harmful to air quality and public health, the lesson I take is that there are no easy solutions. We must all do our homework by staying on top of current knowledge and then putting it to good use. Trees are clearly more than just trees. CHURKINA, G., GROTE, R., BUTLER, T. M. & LAWRENCE, M. 2015. Natural selection? Picking the right trees for urban greening. Environmental Science & Policy, 47, 12-17. GROTE, R., SAMSON, R., ALONSO, R., AMORIM, J. H., CARINANOS, P., CHURKINA, G., FARES, S., LE THIEC, D., NIINEMETS, U., MIKKELSEN, T. N., PAOLETTI, E., TIWARY, A. & CALFAPIETRA, C. 2016. Functional traits of urban trees: air pollution mitigation potential. Frontiers in Ecology and the Environment, 14, 543-550. Especially on the basis of what has been said. Now appears! … Albricias! … The question of my comment in Spanish has been answered. Indeed Christine, if only a conjecture, the microbial interaction as a whole may be a first “Ariadne thread” to understand the complexity of this type of interactions. By analogy, a human (which is a system) possesses various microbiomes (pulmonary, intestinal, blood) it is consistent to assume that a system conformed by the plant (or multiple plants and associated fungi) is sensitive to certain conditions. I do not know if under certain conditions the microbiome associated with plants induces them to react in the production of VOCs, however (if it is useful) the phenomenon resembles the communication between African acacias. he publicado antes un comentario (pero no aparece) donde te comentaba que un enfoque microbiano enriquecería la perspectiva global… ¿Sabes a que ignoto lugar habrá ido a parar mi comentario? Gracias por tus impresiones, Javier. Our conversations in Madrid [about using plants, bacteria and fungi to break down contaminants (SOx, NOx, heavy metals, ozone) in urban surfaces] opened the notion of microbiomes of entire organisms. In the case of trees, how much do we/ science know about the microbiome of root and leaf zones? We generally assume (know?) that the rhizosphere is effective at breaking down compounds because of the microbes that live amongst roots. What about the leaf zone? I like your suggestion about using microbial symbiosis as a prism through which to investigate such phenomena, and don’t know if anyone is doing this sort of work. Fascinating stuff: there is always something more to learn! Thanks, Diane. That’s a really interesting observation, which makes me wonder whether society’s over-arching valuation of trees’ physical impacts (versus social/ cultural/ psychological) might indicate just how disconnected we modern humans have become. 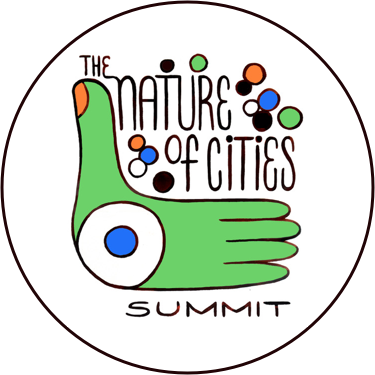 Is our appreciation for “cultural ecosystem services” stunted by the reductionist logic that has shaped the modern mind? Or is it just that urban trees are considered to be domestic and therefore less captivating? You already told me this during the meeting in Madrid. I think we should explore and know if there existed a microbial interaction associated with the tree responsible or associated with this phenomenon. We have already mentioned in Madrid that these VOCs may be the result of secondary metabolites possibly “triggered” by the contamination itself or by influence on the microbial interaction. Thanks for sharing that, Sue, I had a feeling that my photographs on Oxford Rd could soon be out-dated. They are beautiful trees. Good information . Thank you. Excellent piece! The more we delve into where, how, and which trees to plant in highly urbanized areas the more we learn about the complicated interactions between trees, people, and the environment. One thing that intrigues me is that society seems to value the physical impacts of trees – such as air pollution mitigation – much more than their cultural value, aesthetic value, and psychological impacts. But it may be that these “cultural ecosystem services” are the key to understanding the role of trees in cities, even though they’re much harder to measure than physical impacts. So we’ll need more tools to understand the plant-human interactions, and more interdisciplinary collaboration! A great read and a timely piece connecting the complex issues around people interacting with urban woodland. Thank-you for this splendid article, however the green ribbons on the trees on Oxford and Tay Street were part of the decorations for The Centenary Celebration of their planting on 20th March 1917. There are in actuall fact as far as we know 9 trees which are on the felling list at this point in time, some of which are doing very little to no damage to kerbs and pavements!